It is so easy to get used to whatever classroom furniture you already have, especially if you are an experienced teacher. When we were in school, there was no such thing as collaborative desks or soft seating in the classroom, so it’s easy to get used to the idea that students don’t need these things to learn. No matter how easy it is, don’t allow yourself to get stuck in the rut of the status quo! Even if the classroom furniture you have right now is fine, why should you settle for satisfactory, when you could have fantastic? These five questions will help you evaluate what you have and how it can be improved to give your students the best learning environment possible. 1. Does the layout support different learning styles? Some students are more traditional learners and some prefer project-based learning. Some kids do better when they are working independently, and others shine when they collaborate with a group. In the same way that we try to vary the types of learning and assignments that we give our students, we also need a layout that enables us to create the optimal setups for various kinds of learning. When thinking about a flexible layout, the sizes and shapes of the work surfaces in the classroom can have a major impact. 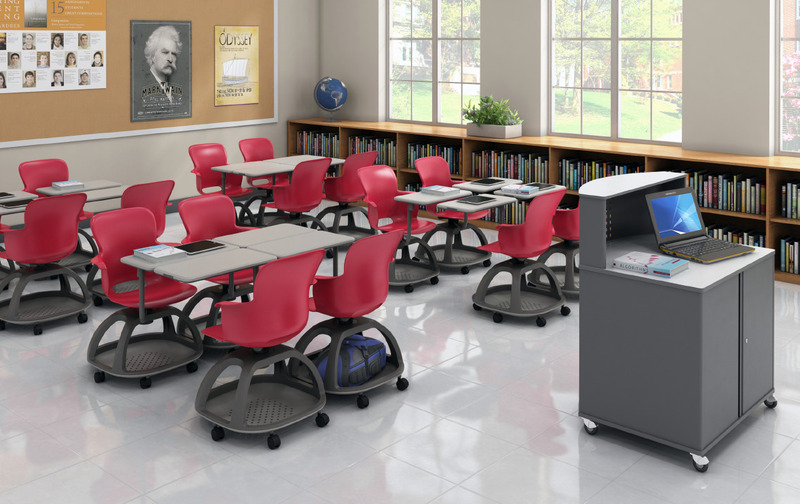 Don’t just choose any collaborative desk that looks cool and modern, make sure that it will also be easy to move around and accommodate individual learning as well as groups of various sizes. 2. Is the furniture easy to move around? Flexible layouts are wonderful, but not if it takes ten minutes to rearrange the classroom when moving between activities. Whether you have collaborative desks or more traditional rectangular work surfaces, being able to move them around easily is ultimately what makes a space truly flexible. Locking casters are ultimately the ideal facilitator for flexibility. When the chairs and desks are on wheels, it’s easy for the students themselves to just glide them from place to place, even in the middle of a lesson. You can even choose to put wheels on only two of the legs, and then the desks can be moved around wheelbarrow-style. 3. What kind of seating choices are you offering? The great thing about offering a variety of seating is that you don’t necessarily have to say goodbye to what you already have. You can still keep the traditional school chairs for those students who prefer them, and just add some more options. 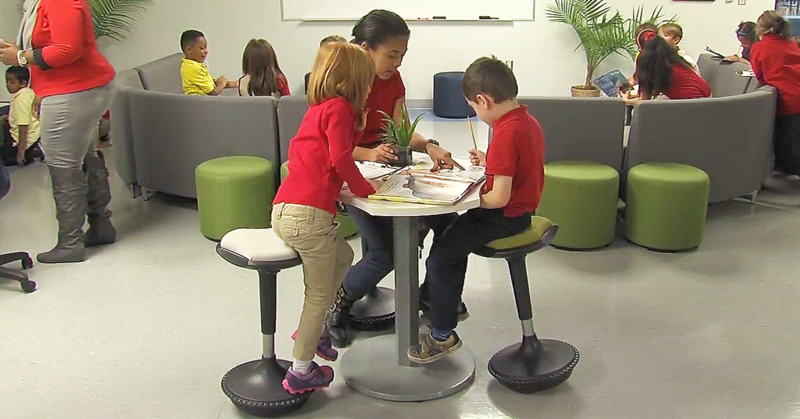 Wobble stools are making a big difference for students who have a hard time focusing, because their gentle movement allows kids to release energy, thereby increasing focus on the lesson. Soft seating is another option you might want to consider. Soft seating is comfortable, colorful and flexible. It allows students to relax a bit in the classroom. Some classes are even using cafe-height stools with the cafe tables to go along with them. 4. Is this furniture functional? If you are just used to what you have, you may never take the time to consider whether you really need everything that you have in your learning space. For example, you might have some file cabinets or shelving that really aren’t necessary but have always been in your classroom. And the same goes for thinking about new and exciting things that you want to add to your space. Don’t choose things just because they have a modern flair, make sure to invest in things that you actually need, which will change the way your students learn, for the better. If you find some items that don’t necessarily need to be in your learning space, you can move them somewhere else and then enjoy the flexibility that the extra space provides. 5. Is this comfortable and healthy? Consider all of the people in your classroom community, including students, teachers and support staff. Everyone should have a healthy place to sit and work, and that includes the educators. Nobody can work well when they are uncomfortable all day. No matter how cool your seating looks, what really matters is how supportive and ergonomic it is. The same goes for work surfaces. The most important thing about desks is their height. If you are using standing desks, they need to be adjusted to keep hands properly positioned while working. Students should not be bending over or reaching up when they are writing. The same goes for teachers. Even if you have a more traditional arrangement with chairs and desks, making sure that the heights are adjusted to support each student in the best way possible is extremely important. 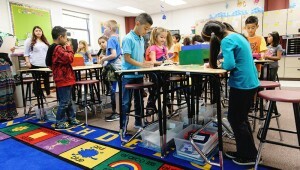 Don’t take anything for granted when it comes to classroom furniture. Make sure to ask the right questions that will help you support your students’ learning. The arrangement of the classroom, and the quality and style of the furniture you fill it with will have a tremendous influence on how your students learn.